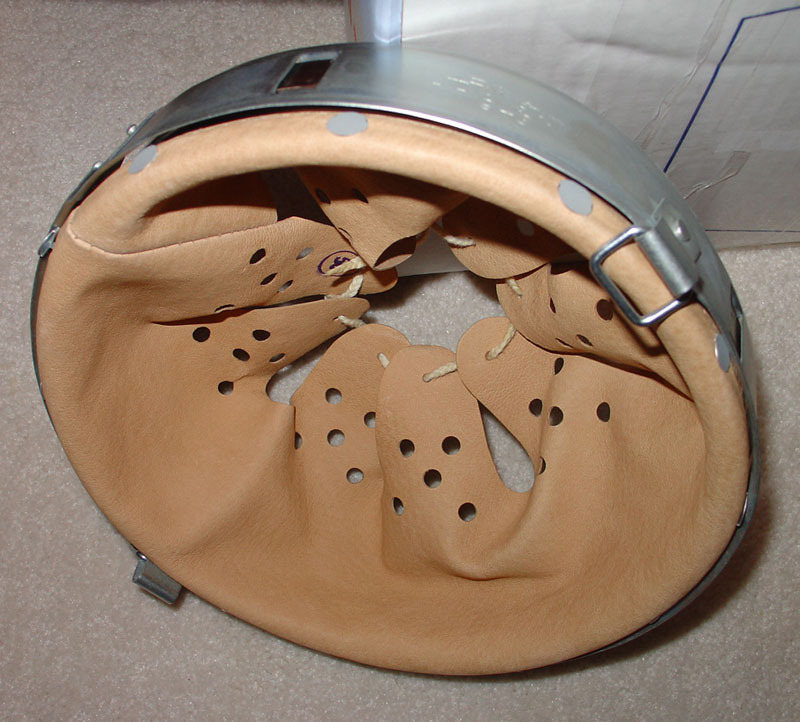 Helmet liner is a soft or padded lining that fits inside a metal helmet. Liner system for World War II German helmets refers to Model 31 Liner which had some material changes in years. The liner band was the innermost part of the helmet and the portion to which the leather liner was attached. As an entire unit, the liner consisted of two metal bands and an eight finger leather liner and drawstring. M31 liner was secured to the helmet shell with three retaining Rivets. These rivets were positioned on the shell with two located on the front of the helmet near the temples and one rivet centered squarely on the back. Earlier helmet liners were made from aluminium frame and a mix of steer, goat, or sheep hide for leather parts. First, aluminium was switched to zinc plated steel on 1940 to reduce costs. With the invasion of Russia and a new front developing in North Africa, the demand for leather increased because much of the German field gear at the time was made from leather; Y straps, ammo pouches, belts, boots and e-tool covers. New sources of leather would need to be found for helmet liners and some manufacturers started to make them using pig skin which was more coarse and uncomfortable. LRE-35282 includes 7 helmet liners that will fit all World War II German Helmets released by Live Resin. The set is served inside a folded cardboard cover and a zip-lock bag including one sprue with liners is stapled to the cover. Both sides of the cover show information and photos of the content. There are seven 1/35 scale,cast in grey resin German helmet liners in the kit served on a casting block. Liners can be easily removed from sprue. Resin quality is very good, details are very crisp and clean. Details like seperate leather flaps, holes and drawstring are well defined. To check fit of liners to helmets, I used one each from LRE-35278 and LRE-35279 German M42 Helmet sets. Please remember that when removing helmets from casting blocks; first cut the part connecting helmet and block, then clean the pin inside the helmet which makes it harder for this process. Otherwise, helmet can be cracked or broken. This is a nice kit to detail your World War II German helmets and display them showing inside as you add D-strings and chinstrap parts. It is noted on the cover that they can be used for all Live Resin helmets but I think these liners will also fit to helmets of all brands. Highs: Clean cast in crisp details. Multiple use for helmets of many brands. Thanks for the historical backgrounder! I could definitely use these in conjunction with the nice helmets that this company also markets. These look realy useful as currently if modelling Germans in casual settings bareheaded, I'm having to put helmets turtle up which isn't a normal way to put a helmet.They land upside down when taken off. This whole helmet package is fantastic and I think I'll pick all of them up at some point. The detailing looks spot on.